A 77-story tower from JDS Development would be right next door to the already growing 80-story Extell tower. LOWER EAST SIDE — The city is currently looking into two proposals aimed at addressing the rapid-fire development of the Two Bridges waterfront — one that would cap building heights and another that would make it more difficult for developers to build high-rises — as residents grow increasingly anxious over the influx of super-tall buildings in their neighborhood. 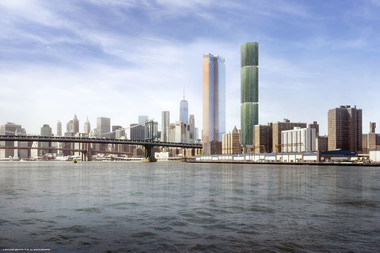 The Department of City Planning is reviewing a proposal from elected officials that calls for a set of planned waterfront high-rises to be viewed as “major modifications” that would go through the city’s Uniform Land Use Review Procedure (ULURP) — an extensive, seven-month approval process requiring review from the local community board, the Borough Board, City Council, and the mayor himself. Under the current zoning, three prospective large-scale developments slated for the waterfront are just “minor modifications,” meaning they could be approved by DCP without undergoing the thorough review process of a ULURP. But local elected officials say that given the significant impact the developments would have on the surrounding community, the categorization needs to change. The letter is signed by Congresswoman Nydia Velazquez, State Assemblywoman Alice Cancel, Manhattan Borough President Gale Brewer, State Senator Daniel Squadron, and Councilwomen Margaret Chin and Rosie Mendez. A 77-story residence from JDS Development — going in next to Extell’s 80-story One Manhattan Square, which is allowed under the parcel’s current zoning without approval from DCP — has already drawn the ire of the surrounding community, who say it will bring a host of quality of life issues to the densely-populated area. And while the JDS monolith is the only incoming development to have been publicly confirmed and unveiled, there are potentially two others slated to dwarf the Two Bridges area. Two Bridges Associates, a joint venture of L + M Development and the CIM Group, are “evaluating development options” for a Cherry Street site, according to a rep.
A JDS rep in May told The Lo-Down a waterfront parcel owned by the Starrett Corporation may be slated for development, though Starrett has yet to publicly confirm the plan, and representatives for the company did not return a request for comment. Meanwhile, community members and advocates — fearing displacement and quality-of-life concerns that could stem from a dense influx of high-rises — continue to push for a neighborhood rezoning that would cap building heights at 350 feet, guarantee a percentage of below-market-rate housing and require anti-harassment certification from prospective developers. Even if the city were to heed officials’ call for a waterfront ULURP — which would work faster to check overdevelopment than a rezoning — the area is still in desperate need of height limits, advocates say. The rezoning plan developed by the Chinatown Working Group — a coalition of neighborhood organizations calling for neighborhood-wide capped building heights and anti-harassment measures — is currently being workshopped by DCP, which has met with community board reps and elected officials to discuss the implementation of the plan along the waterfront and other pockets of the Lower East Side. The department is now reviewing three subsections of the plan, having previously argued that the plan in its entirety was too broad and unfocused. After Community Board 3 identified the NYCHA properties, the core of Chinatown, and the waterfront area as most pressing, the city met with the board and politicians to discuss plans for the three areas, though many members of the working group are strongly opposed approaching the plan a subsection at a time. At a recent CB3 land use meeting, former board chairwoman Gigi Li, who is currently running for State Assembly, stated that the city department had recognized the concerns around rapid-fire development in Two Bridges, and had committed to addressing the waterfront parcel “before any other” — though a rep for DCP would not confirm or deny that this was the case. “They recognize…the waterfront needs to be addressed and they need to take a position on it first and foremost, out of all three subdistricts,” said Li. “We will work with neighborhood stakeholders, including Councilmember Chin and Community Board 3, to find a feasible and focused proposal that can advance the community’s top planning objectives and can lead to the area being mapped for MIH, which would create a source of permanently affordable housing in the neighborhood,” said press officer Joe Marvilli.